Would you like some help in getting into the proper frame of mind to receive our Lord in Communion? How about asking His Blessed Mother for assistance? In this “Prayer to the Blessed Virgin before Communion,” taken from an old prayer book, we find hints of a more famous prayer to Mary, the Memorare. As in that stirring prayer, we don’t just ask here for our Blessed Mother’s help and protection in helping us on the road to sanctity, despite our sinful nature. We fly to it, as in moving with great haste! O most Blessed Virgin Mary, mother of gentleness and mercy, I, a miserable and unworthy sinner, fly to thy protection with every sentiment of humility and love; and I implore of thy loving kindness that thou wouldst vouchsafe graciously to be near me, and all who throughout the whole Church are to receive the Body and Blood of thy son this day, even as thou wert near thy sweetest Son as He hung bleeding on the Cross. Aided by thy gracious help, may we worthily approach this august Sacrament. Keep in mind as a matter of course that when we pray to Mary, as to the Saints, she receives our honor not our worship. She has never stood in the way of anyone worshipping her Son, far from it! This prayer also gives us a poignant reminder that the Mass is a reenactment of our Lord’s sacrifice at Calvary to His heavenly Father, only in an “unbloody” manner. Christ is indeed present as in His Crucifixion, but His body, blood, soul and divinity are present to us under the appearances of bread and wine, rather than as a figure “bleeding on the Cross” as we read above. Also, as at Calvary, he offers Himself up to His heavenly Father (through the prayers of the priest saying the Mass) for the forgiveness of sins. This “Prayer to the Blessed Virgin before Communion” also brings to mind Mary’s profound anguish at Calvary. She stood by her Son there as he was covered in blood literally from head to toe, being mocked and undergoing such tremendous physical and emotional suffering that she herself experienced it in her soul. As Saint Jerome, one of the Doctors of the Church, put it so well “every torture inflicted on the body of Jesus was a wound in the heart of the Mother.” Indeed, the hymn Stabat Mater gives us a heartrending acknowledgement of her anguish. 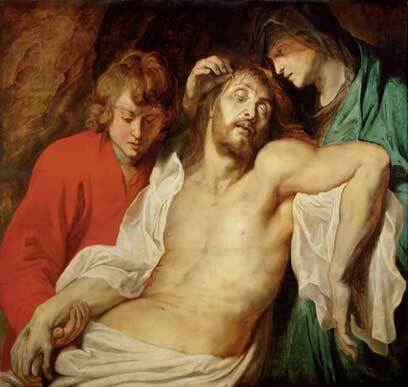 Finally, in keeping with our remembrance of Christ’s Passion here, remember our Lord’s stirring words to Mary and St. John from the Cross: “behold thy son… behold thy mother” (John 19:26-27). It is a firmly established part in our faith that St. John represents all of us in the Church. The Blessed Mother as the mother of the Church is our Mother as well. As such, don’t be afraid to ask for her help, at Communion or whenever else you think you might need it!